ATTIC ANTIQUITY DOLL SHOP reflects Dorothy Meredith's life-long love of dolls. 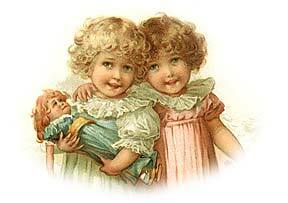 In the shop, at doll shows and on ebay, we sell dolls, doll books and doll accessories. Most of the dolls are from the early 1900s to the 1970s. Inventories vary from antique chinas, bisque or tin head dolls to popular composition characters such as Shirley Temple or the ever-popular mama dolls and Kewpies. We always have a nice selection of early hard plastics like Mme Alexander Cissy, Terri Lee or a mint in the box treasure from the 50s. We carry all of the latest doll books and as many out of print books as we are able to locate. There are hundreds of titles in stock at all times. Whatever you need, if it's an out of print book, pattern book, paperdoll book, the latest price guide or reference book, if we don't have it in stock, we will try to locate it for you. We have a wide variety of accessories for dressing and restoring dolls. We carry synthetic, human hair and mohair wigs and all sorts of doll eyes. We have cloth-covered elastic cord for restringing dolls. We make replacement bodies for magic-skin dolls. We carry socks, stockings, tights, booties and a nice variety of doll shoes. We have reproduced fashions for some of the more popular dolls, like Kewpie, Patsy and Toni. Please don't hesitate to call us with your doll, book or accessory needs. We will promptly return any missed calls and emails.